A converted, spacious, comfortable villa (accommodates 2 families comfortably) on the edge of national park (Parc Regional du Languedoc) and 30 minutes from beaches. 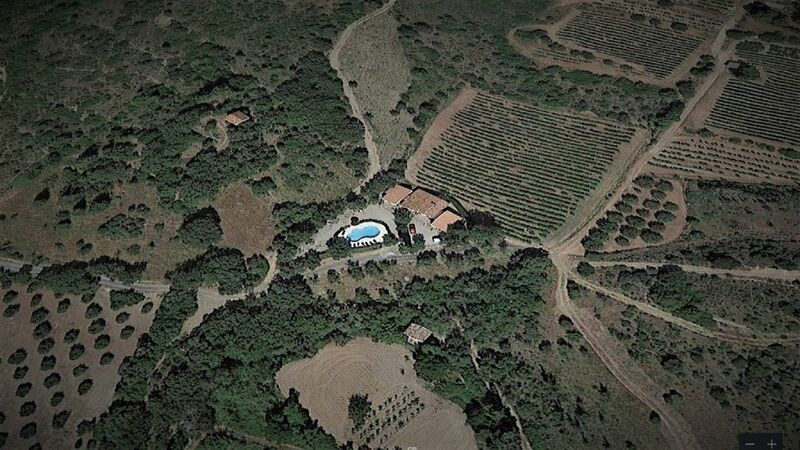 The house is situated in a peaceful, very private location in the middle of vineyards and olive groves. Own large pool with spectacular views. Set between 2 lovely old typical Languedoc villages with all amenities, local restaurants 2km away. Pezenas - a medieval market town is just 10 minutes drive and boasts a plethora of restaurants, street artists, shops and a thriving Saturday morning market. The house comfortably accommodates 11 people (plus a travel cot for babies) and is designed around central living space (kitchen and sitting room) with bedrooms running off either side of the house. Gas BBQ, table tennis table, table football, boules, swing ball, sun loungers, hammocks..
We're an anglo/franco family that designed and built the house around the needs of a large family that enjoys time with friends. St Andrieu is where we come together, relax, eat, drink, dance and sing. The property is comfortable, with vast space outside, in the middle of Vineyards and Olive groves, and has a 5x10 meter pool. It is ideal for relaxed holidays "en famille" with quick trips to the beach, the rivers of the National Park, the Golf clubs of Beziers or Lamalou. The villages of Neffies and Roujan are charming traditional Languedoc villages within walking/cycling distance boasting restaurants, bars and bakeries. Wonderfully situated at the foot of the National Park, half way between sea and mountains. Perched hill in the middle of Olive Groves and Vineyards with a beautiful views, plenty of space privacy and tranquility. Bathroom 1 with bath and shower cubicle. Heated towel rails. Separate wc. Bathroom 2 with shower. Heated towel rails. The house boasts a large, central sitting room with open fireplace. There is a flatscreen television with dvd player and hdmi connection but no connection to terrestrial tv. Board games & books. There is large family fridge as well as a small drinks fridge. We also have a freezer in the cellar. We have a policy of using up salt, pepper, oilve oil, spices etc so please use what is available and replace if you finish something. The kitchen and eating area is large, light and modern. Equipped with dishwasher, large fridge, drinks fridge and electric cooker and hob. There is a large dining table with seating for 12 people. There is a sonos system in the house and ipod speakers. A flatscreen TV with a dvd player and hdmi connection. Plenty of dvds for grown ups, families and children. A gas BBQ with gas bottle. A wooden deck is perfect for a shady lunch and sun downers opposite the pool and amazing views of the village of Neffies. A large terrace spans the front of the house with a table and chairs for up to 12 people. There's a parasol and a couple of trees for shade. There are two golf courses (Golf St Thomas and Lamalou Les Bains) within 25 minutes drive - one public and one private. Details available on request. Smoking allowed outside only and we ask that all butts are picked up! The pool is a beautiful kidney shape which blends into the landscape . It's 10m x 5m and is fenced and gated. There are 8 sun loungers. Notes on accommodation: The sleeping accommodation can be found on either side of the central living accommodation.There are two bedrooms & a bathroom on each side of the house, making it ideal for two families. The fifth bedroom is upstairs and very quiet and shut off. We have a safe available for money/keys/passport safe keeping. Outside: The house has a private garden with a large, sunny terrace . The kitchen, living room and the two double bedrooms have french doors leading onto the terrace. There is also a decked terrace and eating area under the shade of oak trees and overlooking the pool and the village of Neffies. The pool is enclosed & gated and is 10m x 5m with shallow and deep end. Utility Room: Washing machine and drinks fridge are in the cellar/utility room. There is also an additional wc and shower. Cleaning / Towels /Lined Towels and linen are provided. Other: Table football and table tennis. This villa was easily big enough to accommodate our group of three families. The setting is fabulous with great views from all windows. The pool is gorgeous and cleaned everyday. The nearest villages were walkable and both had charm. Emma and Didier were available if we needed anything and we loved staying in their house. We stay in French villas every year but this one has gone to the top of the list ... we especially enjoyed using the bikes to cycle to the nearby lake to see the sunsets. I heartily recommend it! Nous avons passés un excellent séjour en famille et entre amis. Enfants, ados et adultes s'y sont retrouvés. La maison est très bien conçue avec tout le confort nécessaire et la piscine est très agréable. Les propriétaires sont très sympas. Nous avons été accueillis par Didier et son fils, un grand merci à vous pour votre gentillesse et votre accueil d'ailleurs, votre maison est un vrai petit coin de paradis pour les familles et amis aimant se retrouver en toute convivialité. Nice house beautiful and unbelievably peaceful. The villa is very spacious and confortable, well equipped and with a very nice decoration. The pool place are beautiful and safe for kids. We had a great week with family. A great villa, beautifully kept and in a fantastic location. 10 of us spent two weeks here and had an amazing time. The villa is spacious and very well equipped and the pool is a very good size (a safe for kids). Everything you need is within a few minutes drive and there are plenty of beaches, lakes and beautiful town to visit within 30 minutes to 1 hour. Emma & Didier are very helpful and went out of their way to make sure that we were well looked after and happy in their lovely house. The setting is amazing and unbelievably peaceful, I couldn't recommend it highly enough. There are several beaches with full resort amenities to choose from within a 30 minute drive. The largest and most simple is bewteen Sete and Agde. For more lively beach life, Cap D'Agde is about 25 minutes away. Montpellier (Easy Jet from Gatwick & Luton) 50 minutes drive. Beziers (Ryan Air from Luton & Bristol) 30 minutes drive. Nimes (Ryan Air from Stanstead & Luton) 1 hour drive. Carcassone (Ryan Air) 1 1/2 hours drive. Perpignan (Ryan Air) 1 hour drive. Roujan and Neffies - both 2km from house. Bakery, butcher, grocer, bank, bar, restaurants. Pezenas - 10km. A lively medieval market town with great restaurants, bars, galleries, anitque shops and a market every Saturday morning. Beziers & Canal du Midi 30 minutes drive. Montpellier - 40 minutes away. Inland Swimming: The Barrage des Olivettes is 2 minutes away, and there are many gorges and rivers in the area for swimming. Watersports: there are sailing, windsurfing and canoeing facilities nearby at the Lac de Salagou (1/2 hr) and kyaking in the river Orb. Walking: The area is a walkers paradise with many walks starting from the front door. Wine Tasting: there are plenty of opportunities to taste wines of the area from both private estates and the co-operatives typical in all the local villages. Horse Riding: there is a riding stables within 5 minutes of the house. Tennis: - there are municipal tennis courts in nearby Caux. Restaurants: there are many restaurants in the area. Full details can be provided on booking. Booking Notes: Bookings direct with owner. Changeover Day: Saturday. But flexible depending on bookings. Arrival after 4.00pm and departure before 10.00am Notes on prices: There is a 10% discount on 2 week bookings. Prices are for the property per week (or two weeks) in GB £. All payments should be made in advance of rental period by bank transfer. A 20% refundable deposit is due on confirmation of booking.